Patch: Eventsview controls. With settings applet. Patch for SailfishOS 1.1.7.24 adding controls to eventsview page. This version contains settings applet you can use for selecting preferred behaviour of controls in eventsview. Disable and uninstall old patch before installation. Can we have this on SFOS 2.x? 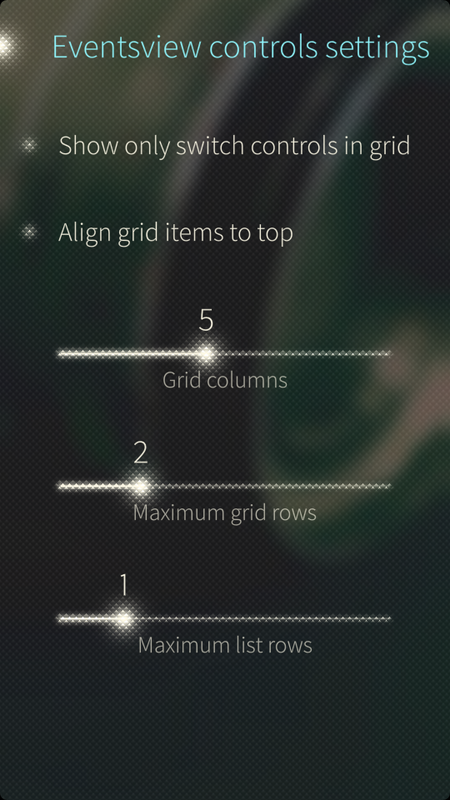 For example, displaying first 3-4 rows and have a “Show more” option like notifications. After upgrading to SailfishOS 1.1.7.24 the package will not install anymore. i updated this patch earlier today and after that i went to my settings and my mobiledata toggle was disappeared. Toggling mobile data on and off from mobile network page works fine tho. ouh, and now i noticed that i cannot access to my sounds settings at all. So what? Go and repair your phone with https://jolla.zendesk.com/hc/en-us, or do a factory reset. ok, i just wondered if i could fix this without factory reset. Already did it tho. Because it's not a place for asking such questions. Use forum or irc. Data connection toggle seems to be broken. Can't click. Thanks for update. The most usefull patch with launcher combined .. ! Hope to see it on 1.1.6.27 soon ..
Events view is really useless without this patch. Doesn't seem to work in 1.1.6.27 for me. It showing like patch is installed but when I try to unapply I get :Failed to remove patch. Works fine ,before I installed jolla-lipstick-home-qt5. Any hints how to fix it. so, why you did this without unapplying patches? The mobile data switch (in eventsview applet) allows turning it on, but not off. Allows on and off in the stock settings app. Edit: Works again, thanks a lot. Fails to (re-)install with 1.1.4.24 "Äijäpäivänjärvi" (silent unsollicited OS update). Its working fine but just the four switches like the settings page. I'm not able to configure like the screenshots shown.